Who Is It Right For? Is it Better or Worse Than a Fitbit? UP3 Heart Rate Sensor What Doesn't It Do? The Jawbone company discontinued production of activity trackers in 2016. As of the summer of 2018, the future functionality of the app and support of existing devices is uncertain. The following relates to how this tracker worked in the past. The Jawbone UP3 fitness band adds a heart rate sensor and advanced sleep and activity tracking to the other features found on the UP2. With this extra data, the app's Smart Coach feature is even smarter in giving you advice for a healthy lifestyle. Do these added features make it worth the extra cost? Does it beat Fitbit? If you want to be more active, sit less, track exercise automatically, sleep better, eat better, and have an overall healthier lifestyle, the Jawbone UP3 is a great choice. You must use the UP app with your Bluetooth-capable mobile device as it has no display of its own. If you never check the app, you won't get the benefit of wearing the UP3. The stylish but simple design means no buttons to push, no way to forget to start and stop tracking exercise or sleep. The UP3 does that for you. Just open the app and you will see all of your data, plus Smart Coach advice gently nudging you, offering suggestions to improve your healthy lifestyle. It doesn't give you exercise heart rate, GPS-based speed and distance or other features you might want for a workout tracking device. It won't replace your heart rate monitor. Is it Better or Worse Than a Fitbit? 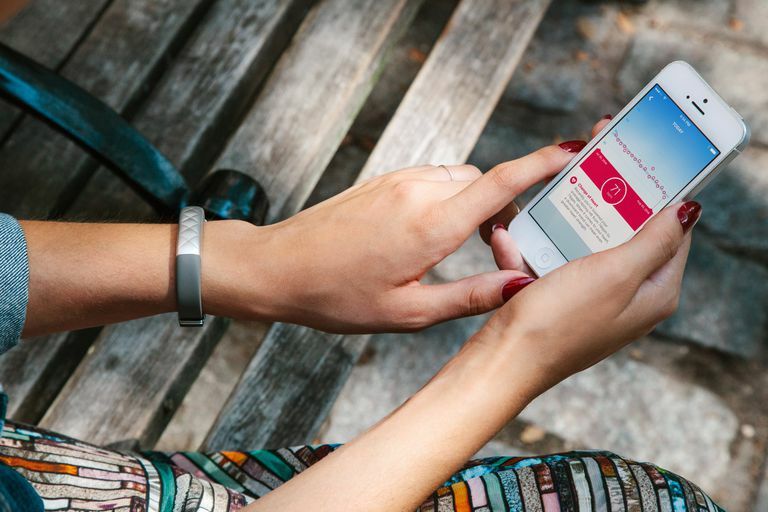 The Jawbone UP3 beats most Fitbit models by having the vibrating Idle Alert to remind you to move. Fitbit doesn't have the Smart Coach messages that give you great advice throughout the day. The UP3 heart rate sensor doesn't give you exercise heart rate like the Fitbit Charge HR does. It has no numerical display as most Fitbit models do. The bioimpedance sensors on the inner side of the band monitor your heart rate, respiration and galvanic skin response. Just before you wake up, it automatically registers your resting heart rate. Changes in your resting heart rate can show if you are fatigued, dehydrated, or have been overtraining. The Smart Coach in the UP app uses the resting heart rate to give you advice on getting enough sleep and activity. You can view your resting heart rate trend by day, week and month. Throughout the day, the heart sensors register your passive heart rate whenever you aren't moving. You can view the daily graph and see the peaks and valleys in your passive heart rate. The Smart Coach uses this to give you advice on exercise, rest, stress, hydration and diet. What you don't get is exercise heart rate. Although UP3 automatically detects and tracks exercise, it doesn't read or record your heart rate during exercise. If you want to aim for a specific heart rate zone, you would need to use a separate heart rate monitor. As Jawbone gains experience with the data from the sensors, they may add more functionality to the data and you may see some seamless upgrades in what the UP3 is able to report about your heart rate, sleep, exercise and more. It doesn't display any data on the band, not even a row of lights like the Fitbit Flex, you have to check the app. It doesn't have call or text notifications. It doesn't track exercise heart rate (yet) or have built-in GPS for speed and distance. You can't switch bands, you are stuck with the look you bought. It has no web dashboard, all of your data is in the mobile app. The UP3 comes in eight different colors. The medical-grade TPU rubber strap buckles on securely. I never had it come loose during weeks of wear. You are meant to wear it snug enough so the sensors on the inner strap are always in contact with your skin. The sensors are coated with stainless steel and the casing is aluminum with less than 5% nickel. You should wear it day and night to get the benefits of the automatic sleep tracking. It is splash-proof but not waterproof, so you take it off for showering, etc. Power: Recharge every 7 days via a custom magnetic USB cable. Recharging takes only about an hour, although I found the magnetic attachment a little tricky to get right. Data: Automatic syncing via Bluetooth to the mobile app. No buttons to push, it just happens. Notifications: The band has three colored LED dots: blue for sleep, orange for activity, and white for notifications. Vibration alerts: You can set an Idle Alert so the band vibrates when you are inactive for any period of time from 15 minutes to two hours. Don't worry, it won't wake you up at night, you set the hours during which it is active. You can set other vibration reminders such as when you reach activity milestones, reminders to drink, eat, take your meds or go to bed. The UP app for iOS or Android is the same for all Jawbone UP products, and can even be used on its own without a band. If you're upgrading to the UP3, you continue with the same account and you don't lose your previous stats. With the extra tracking of the UP3, you will see some new kinds of stats in addition to those you may already be familiar with. Daily Activity: With the first screen you have immediate feedback of your sleep and activity, including percentage of step goal and sleep goal, plus your resting heart rate. Tap on the activity total to see your steps, distance, active time, longest active period, longest idle period, total calorie burn, active calorie burn, resting calorie burn, resting heart rate, and passive heart rate graph. You can view all of your past history by day, week, month, etc. You can set a progress notification so you will be alerted when you achieve each 2000 steps or any number between 1000 and 15,000, which can be a good reminder that you need to move more. You can also get a move summary notification so you can know how much is left to do before the end of the day. Advanced Workout Monitoring: You never lose a walking or running workout as UP3 detects them automatically. Once you are done, the app asks if you were active during that period and to identify exactly what you were doing so it can assign it to the right category of exercise. You will see totals for the workout duration, intensity, steps, pace, and calories burned. You can edit the data and easily share it on Twitter or Facebook, etc. If you did a workout that wasn't detected, you can add that in to get credit for the calories and active time. The sensors will give a good estimate of the intensity of your workout beyond simply basing it on the speed, as they are sensing skin temperature, heart rate an breathing rate. In this way, you will know if you really did do moderate-intensity or vigorous-intensity exercise as is recommended for health and fitness. Advanced Sleep Tracking: It knows when you are sleeping. While the other UP bands also detect sleep, the UP3 tracks more details. It automatically detects sleep periods and the graph shows when you were awake, in REM sleep, light sleep, and deep sleep, with the total time for each during the sleep period. It also shows total sleep time, how long it took you to fall asleep, and the number of times you woke up during the night. If it didn't get the sleep period right, you can edit the start and stop time and then it will show the data correctly. You can see your sleep trends for the past week. Smart Coaching: The Smart Coach messages cheer you on for goals, streaks, milestones, averages and trends. The coach will encourage you to specific activities, such as getting in a workout or going to bed earlier. It is very motivational and includes links to more information on different aspects of a healthy lifestyle. Food Diary and Diet Analysis: You can use the app to track what you eat and to balance calories in/calories burned. It has a barcode scanner, food lists, restaurant menus, custom foods, or you can take a photo of what you are eating. Beyond calories, it also tracks fiber, unsaturated fat, carbs, protein, sugar, saturated fat, sodium, cholesterol. See your color-coded nutrition score, aimed to inspire you to make the best choices in what you eat. You can also log your weight and your mood. The UP app makes this a great pedometer for dieters. The Smart Coach encourages you to get social and add friends, tracking your data together and engaging in friendly Duels. You can determine exactly what is shared. The Jawbone App also will share data with many other popular fitness and health apps, including Apple Health. I am a fan of the inactivity-reducing vibration alerts you get with UP2 and UP3. I need to be reminded to step away from the computer, and it's great to be able to customize how often you get these alerts. The resting and passive heart rate numbers are mostly used by the Smart Coach to recommend rest and exercise. I find them mildly interesting, but not as much as getting exercise heart rate. I prefer a band with a numerical display rather than having to open the app to see my numbers, but the custom notifications of your step count help keep this in mind rather than invisible in an unopened up. Automatic sleep and workout detection are great features, as you soon realize if you forget to start and stop this with other activity monitors. The Smart Coach tips are an excellent way to get nudged to improve your habits for better fitness and health. Which New Fitbit Will Fit You Best?